I have just returned from a wonderful trip to visit the family in Argentina! Although everyone complains about the current President, she seems to have made some improvements ... although still some ways to go... most importantly the country can now claim that they held the biggest BBQ in the world having cooked up 13720kg (!!) of meat in one afternoon ... that was some BBQ...! My aunty Lemy comes from a Lebanese heritage and so I am very lucky to have access to all her amazing recipes! Her children are all amazing cooks as well and have learnt some wonderful recipes - it's wonderful seeing the culinary genes activated! 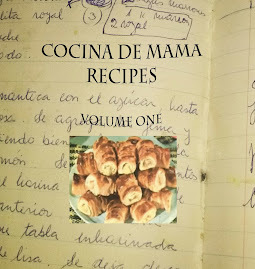 Remember if you have a recipe you would like to share - write to leticia@cocina-de-mama.com - all recipes are welcome! Take the julienne chopped onions and lightly cook in a pan with some oil and a pinch of salt until translucent. Once cooked leave to cool. Take a pan (any shape you like) and cover the base in oil. take some of the mix and place in the pan in small bunches. On top place the cooked onion so it covers the mix. Put the rest of the mix on top and mark with knife diagonally to make a nice pattern. Cook in a preheated oven at 180 degreesuntil cooked through. Eat warm or cold! Delicious! My grandma used to make this, and she would laugh to hear you describe it as easy.... In the days before you could buy your own minced meat (and even when Grandma didn't trust shop-bought minced meat - too much fat in it, she'd say), she would spend most of the day delicately cutting fat off lamb, and then running all the lamb through her own mincer for hours. 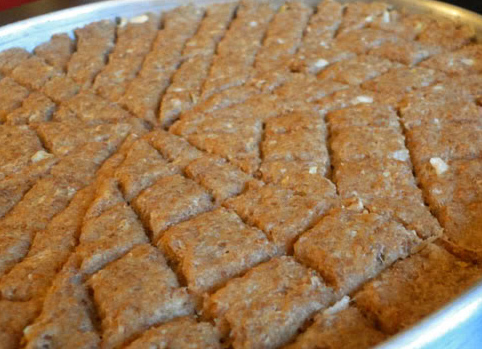 By the mid-afternoon, she would set to make the kibbeh, dipping her hands in a big bowl of water filled with ice while she kneading it, to keep the meat cold. Thanks for the walk down memory lane, Teesh!